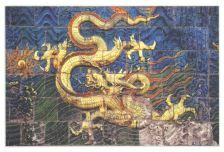 The Nine Dragon Screen of Datong is easy to find. Located near the very center of the (former) Old Walled City Section on, it stands just a short walk East along Dong Dajie' from the Old Cities' current central intersection. You Can't miss it ! 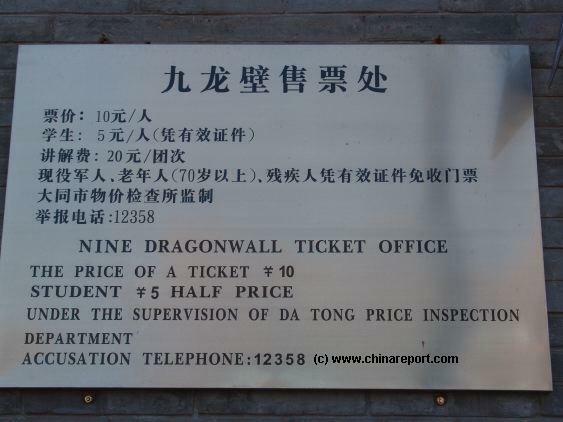 The Official Ticket to see the Nine Dragon Screen of Datung, the only one in China except for the 2 in Beijing (Beihai Park, Imperial Palace). earliest nine dragon screen in China entire. nearly raised to the ground. 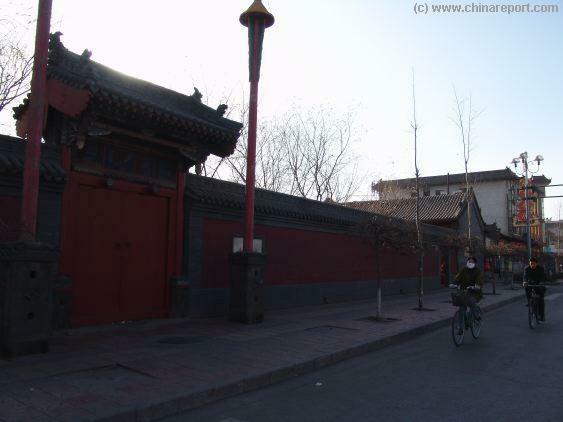 Although it certainly was not the end of the town of atong as a military fortress of considerale strategicimportance, no new Palace was built during the succeeding Qing Dynasty (1644 AD - 1911 AD), a Dynasty of nomadic Manchurian descent. In due time, the Kangxi and Qianlong Emperors would unite Manchuria with Mongolia and China, thus finally bringing north and south of the wall together. with greater powers but also heavier responsibilities. Zhu Gui was one of the eight Kings thought worthy of handling the Important task of defending the Empire, pursuing the claimants to the legacy of the Mongol Yuan Dynasty Throne and preventing their resurgence on the (Inner) Mongolian Steppes. Not much later on, the task of the Royal commander also included overseeing defenses on the Great Wall. 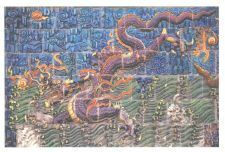 The Dragon Screen, thus was part of an important Royal Palace during the Ming Dynasty and Datong was a vital Frontier City with a considerable garrison. 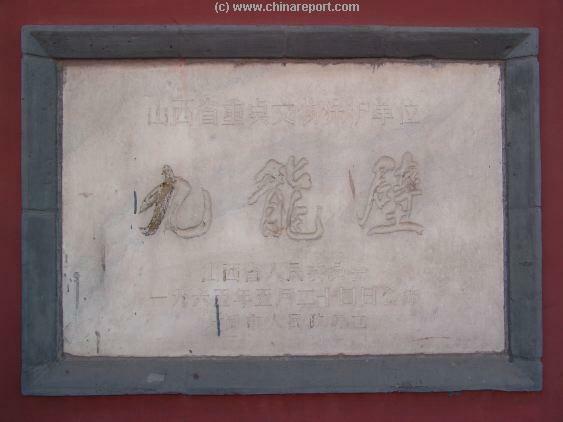 The main duties of Garrison and King were to guard YanMenGuan Great Wall Pass against frequent and dangerous Mongol Invaders. This function would land the City in the middle of Battles on more than one occassion. Details of Dragons on the Nine Dragon Screen of Datong, North Shanxi. find his Throne already usurped upon his return to the Chinese Capital of Beijing in the year 1456 AD. In the end Yingzong was only able to return to the Throne after a lenghty house arrest and final demise of his own brother, the new Emperor. As a result of al the dram andd intrigue, the Ming Empire was shaken and even more importance was given to the strategic City of Datong and protection from invasion from the North. 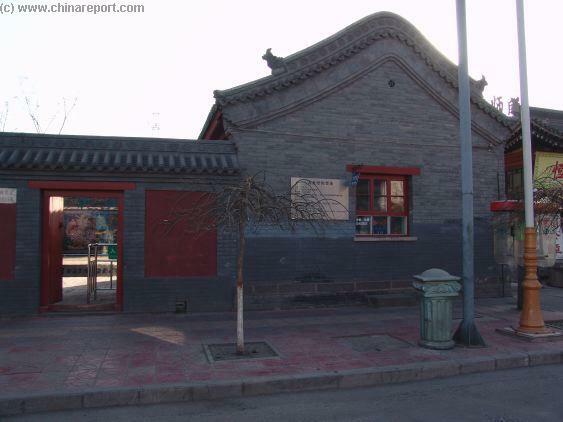 Datong is located and ravaged the country side. out behind its massive earthen city walls. even greater numbers and force. Once more the Palace survived. Overview of the outer wall surrounding the Nine Dragon Screen of Datong Site. Not widely advertised it is easy to miss or overlook. it an important historical site. 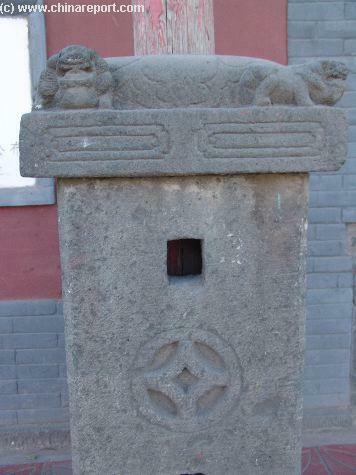 Mythical animals atop stele guarding the Main Gate. A Buddhist wheel of life is the only other decoration. 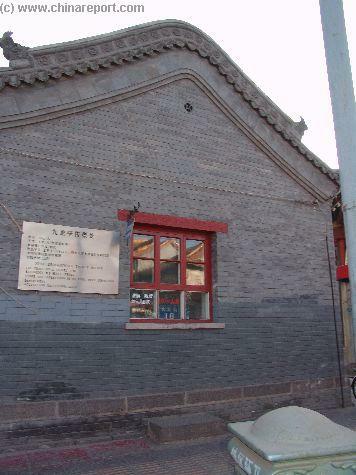 November 2004 Information at the Ticket Office at the Nine Dragon Screen site of Datong, North Shanxi. 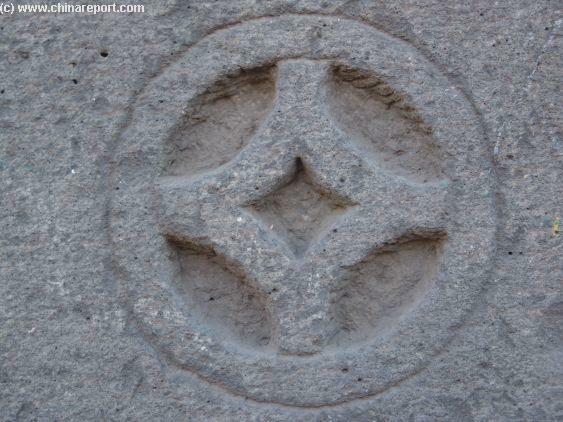 Weathered marble plaquettes declare the Dragon Screen of Datong an important historical site. 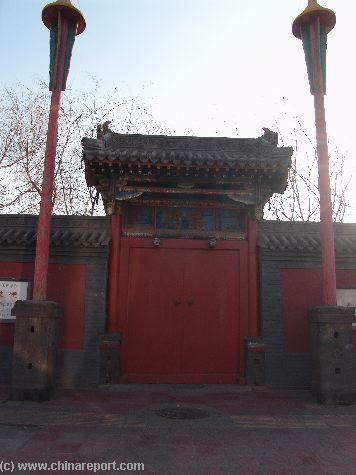 Frontal view of the Ghost Gate into the Nine Dragon Screen grounds. Overview of the Street outside the historical site, looking towards City Center. 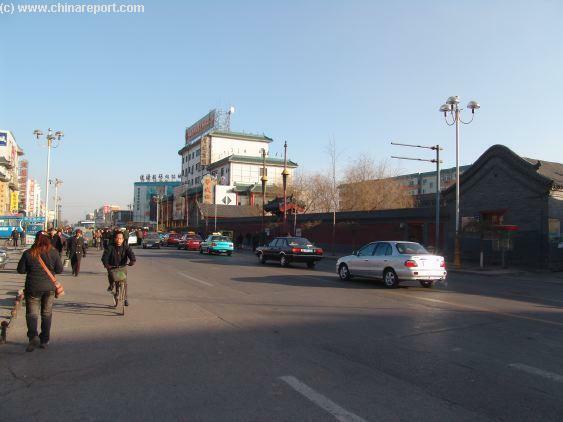 Although still poor, Datong has plenty car traffic nowadays. 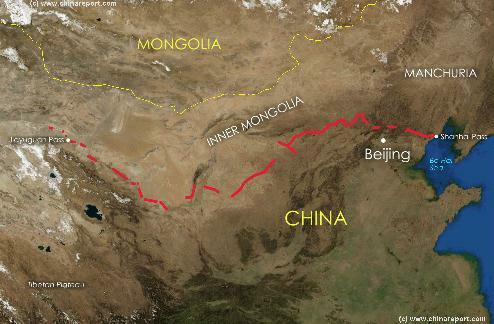 Overview Map of Great Wall of China defenses during the Ming Dynasty (1368-1644 AD). Wei are usually dubbed the Liao Dynasty in China, a term which seems to suggest a sinification of the Barbarians by more advanced Chinese Cultural traits. Just to the West, and south from the intersection is the Ancient City Drum Tower. 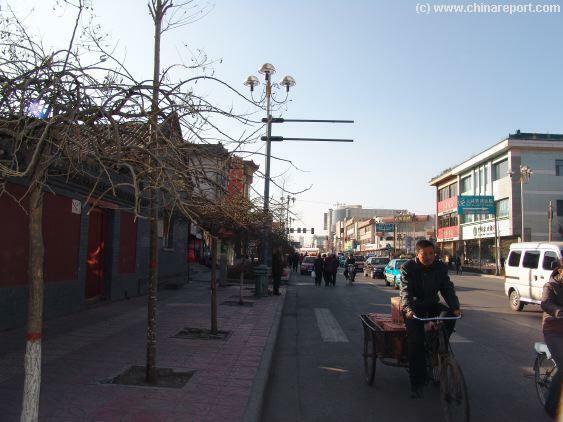 As a matter of fact, due to the small size of Datong during most of history, most historic city monuments are within walking distance. Last but not least, conveniently located, the luxury 5 star Yungang International Hotel with its excellent service and comfortable rooms stands only one block from the Main Intersection, making it easy to see the most and explore on foot. Dragon Screen remained for a long time, even after the destruction of the Imperial Palace that it was part of. 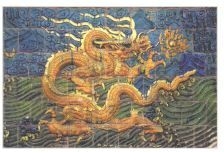 Even today, the Nine Dragon Screen is famous around China. Not only for its record-breaking size and history. "temporary" Palace there for some period, overseeing the defense of the northern border and the clean-up of remnants of the forces of the fallen Yuan-Dynasty 1271 AD - 1368 D) which were still scattered in the area. Zhu Yuanzhang had 26 Sons. made Kings of their own fiefdoms, together ruling all area's of the Empire.